I just changed (from 17/40) to 17/38 sprockets and drove it to work today with 17/38 for the first time. As expected, it ”moves up” the speed range for each gear. If you used to go 35 to 50 mph in 4th gear, for example, now you would go 40 to 55 mph. A lot of my commute is 50 mph and hilly, so I was in 4th gear a lot where I used to be in 5th gear. Fourth gear is more comfortable than before at 50 to 55 mph – 5th gear is less comfortable at 50 to 55 mph. Fifth does not climb hills as easily as before. With 17/38 sprockets, 5th gear on the Virago 250 is most usable above 60 mph. That ↑ was the good news. Now here is the bad news. 17/38 works so well because you can be in a lower gear – except over 65 to 70 – when you are in top gear. Fifth gear does not climb hills as easily as before and strong headwinds affect the bike more – this is expected, but is still a downside of 17/38 – “less power” over 65 to 70 mph (because you can be only in 5th gear). Fifth gear with 17/40 is a little stronger that 17/38. A six-speed transmission would be cool – on the highway, you could choose to travel in either 5th or 6th gear – depending on the wind, hills, and other conditions. For me, with 17/38 I have more power less than 65 mph (because I can be in a lower gear) and less power over 65 mph (5th gear). The Virago 250 is still very good on the highway for a 250cc bike – and it has a great midrange torque for a 250. Update August 5, 2013 – This morning there was a strong headwind coming to work. Now that I have a 38 tooth rear sprocket, in 5th gear, it was bogging – reminding me of my CB160. When I got to work, I kept thinking that I should have gotten a 39 tooth rear sprocket instead………….. 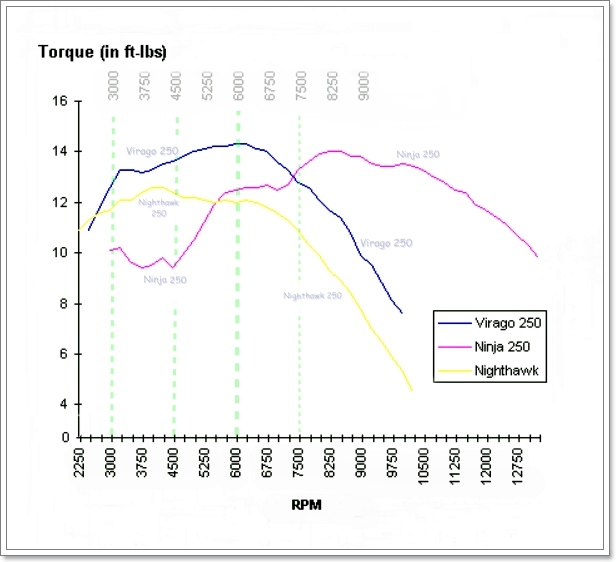 This entry was posted in Motorcycles and tagged Virago 250 17/38, Virago 250 17/38 change, Virago 250 highway, Virago 250 rpm, Virago 250 torque, Virago 250 torque curve. Bookmark the permalink. I have a v star 250 & just recently changed gearing to 17-41. Can cruise in 4th gear up to 65mph. Did 95 on the hwy. Cool – with 17/41, 95 mph is somewhere around 7,800 rpm. Hi Les! I live in Argentina. Don’t own a Virago, but my bike is a Keeway Cruiser 250 (chinese) with an exact Virago 250 replica engine. The stock gearing is 16/45 and I was looking to modify that gearing for a high one (perhaps 17/40). 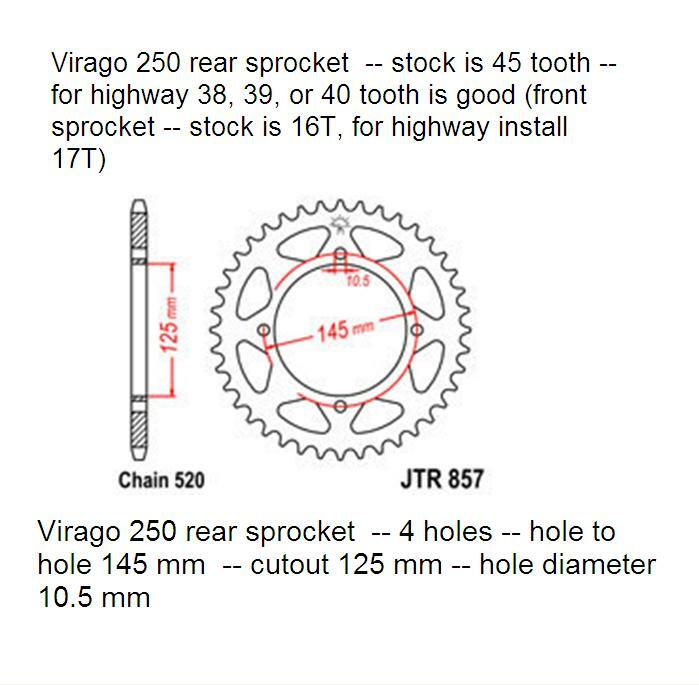 I feel tempted to buy a couple of virago sprockets (front and rear) but I’m afraid of the distances between the anchor bolts (mine has 4) and the center hole diameter. Do you have those numbers? I’m not able to find any Virago sprocket around here to take those measurements. It will be very kind of you. One of my friends is going to travel to USA soon and I will ask him to buy the sprockets for me. Thanks in advance. There are a lot of 250cc v-twin pictures (Virago and Keeway) from Argentina on the internet – I think that the bike is more popular in Argentina than it is in the USA. Hope this helps. I will put a jpg of the rear sprocket on the website. Thanks a lot Les! Your information were very useful. The virago sprockets fits perfectly on my bike and I will be buying those pieces soon. Thanks again!